The New Republic: Slow Down On Solyndra! Amid claims of green jobs, bankruptcy, and commercial competition, the scandal surrounding Solyndra has turned into an argument over the costs of government action. The New Republic's William Galston explains why we shouldn't be too skeptical of solar power. The New Republic: Slow Down On Solyndra! 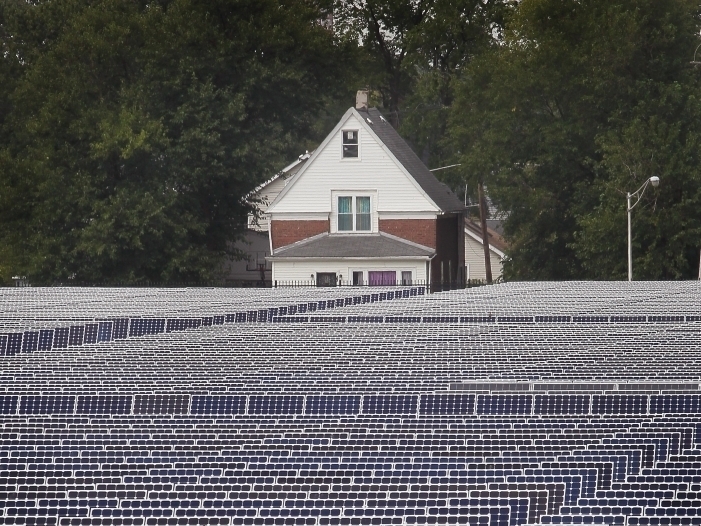 Solar photovoltaic panels generate electricity at an Exelon solar power facility on Sept. 1, 2010 in Chicago, Illinois. The 10-megawatt facility is the largest urban solar installation in the United States. The bankruptcy of Solyndra, the solar energy company that received a $535 million loan guarantee from the Department of Energy, has touched off the predictable partisan food fight, with the Obama administration on the defensive. The release of an August 2009 financial analysis commissioned by the Department of Energy suggesting that the company could run out of cash by September 2011 hasn't made the administration's task any easier. This episode fuels the growing sense that "green jobs" is a slogan in search of a policy. But many conservatives are going farther, using Solyndra to argue that government is inherently incapable of promoting commercially viable technological innovation. That's simply not true, and here's an example that proves it. When World War Two broke out, Japan quickly overran about 90 percent of the world's natural rubber supply, leaving the United States with a rapidly dwindling stockpile and no commercial process to produce a general purpose synthetic rubber. FDR formed the Rubber Reserve Company, which called for the annual production of large quantities of the synthetic to supplement conservation efforts. As the U.S. war effort ramped up after Pearl Harbor, the problem became urgent. By the summer of 1942, a blue ribbon committee recommended the immediate construction and operation of more than 50 synthetic rubber plants. Private companies were to build and operate the facilities, while government supplied the capital and retained ownership. Skeptics might say that this example proves too little or too much. Sure, if government provides the capital for physical plant and funds the research as well, in wartime circumstances when cost considerations are subordinated to military necessity, private firms can make profits at the margin. But despite the perennial quest for the "moral equivalent of war," there isn't one—witness the Carter administration's failed plunge into "synfuels." The skeptics are right to this extent: When cost matters—i.e. when the issue isn't an urgent necessity but rather the choice among competing options—proponents of government action have a higher bar to clear. Typically, the stumbling block to innovation isn't technology, but cost. Yes, China is offering subsidies to its domestic manufacturers that dwarf what Solyndra or any other U.S. firm received, and that tilts the competitive playing field. But even without the Chinese, Solyndra would have been in deep trouble. As Brad Plumer points out, citing Westinghouse Solar CEO Barry Cinnamon, Solyndra invented a solar panel that didn't use silicon (unlike its competitors) and then got creamed on costs after silicon prices plunged. This brings us to the nub of the matter. While a handful of innovative products may be able to make it on their own, the core argument for "green technology" is that the market price of fossil fuels doesn't reflect their real costs: Taxpayers bear the burden of the defense spending needed to secure foreign oil supplies, and we pay both publicly and privately for the environmental consequences of fossil fuel consumption. But as long as these costs remain external, outside the market price, green alternatives will rarely, if ever, be commercially competitive. The real problem isn't Solyndra; it's a political system without the foresight or courage to enact a meaningful carbon tax, much of which could be used to replace current revenue sources that impede economic growth and job creation. Until we do, our quest for a long-term energy policy, now well into its fourth decade, will remain an exercise in futility.